Based around a series of talks and informal networking, Glug has become one of the most exciting, credible and well-attended creative international events with over 500,000 attendees worldwide. Glug brings together an eclectic mix of people from all creative walks of life; from advertising and graphic design through to fashion and architecture. Since forming a decade ago, Glug now regularly takes place in multiple locations worldwide including London, New York, Sydney, Berlin, Taiwan, Stockholm, Dubai and Beijing. Glug LA was launched in 2017 by Rhiannon Price, VP & Founder at Ichi Worlwide, and Bethan Horton, Head of Marketing & PR at The Mill in Los Angeles. It was standing room only last Thursday evening as The Mill hosted Glug LA: Spring Edition, the second meeting following the inaugural event at Ichi in March. Over 80 people gathered to watch three speakers interpret and explore the theme ‘The Screen’. Catering was provided by di Alba, an offshoot of New York City’s The Smile and Smile To Go helmed by chef/partner Nina Clemente. Glug LA attendees were fueled on focaccia with seasonal accompaniments inspired by those that Nina grew up eating during her childhood visits to Italy. In keeping with the official theme of the evening, guests were treated to live screen printing by Hit+Run. Participants could interact with the printing process in order to make their own creations on tee shirts, choosing from a selection of imprints provided by Amy Graham, Helen Hsu, Justin Demetrician and Ren Chen, designers at The Mill. The presentation portion of the night kicked off with a hello from host Daniel Midgley, producer at The Mill and witty compere-for-hire. Daniel introduced the first speaker to take to the stage, John Watson, owner of The Radavist. The Radavist is group of individuals who share a love of cycling and the outdoors with a 135k-strong community on Instagram. Fresh from a recent trip of cycling and photography in Scandanavia and Scotland, John shared an intimate insight into his experiences through anecdotes, epic imagery and enthusiasm for the great outdoors. He spoke of his desire to capture “real” moments rather than succumbing to the temptation and pressure to set up the perfect shot for social media. He also spoke to the balance of capturing his experiences in order to share them; with the enjoyment of leaving the screen behind and experiencing the wilderness. John believes that you create a screen anytime you frame a shot, and the key is to capture what naturally appears before you and find the interest and beauty within it. The second speaker of the night was Florencio Zavala; VP, Head of Design at MullenLowe.Florencio approached the theme by talking through his experiences with various ‘screen’ restrictions from print, 16x9 and 9x16 through to the lack of dimensions and restrictions of VR, AR and other emerging technology. Florencio drew on nearly two decades of experience working with high profile brands and institutions including BBH, Google and Shepard Fairey's Studio Number One. Using a combination of best practice, personal development and case studies, attendees took a journey through Florencio’s expertise and his thoughts on the positive, and challenging, aspects that come with each screen dimension. The third and final speaker for the night was Art Gonzales, freelance production assistant and board member for ManifestWorks. ManifestWorks is an immersive workforce development and job placement organization, turning real-world experience into learning opportunities for those impacted by foster care, homelessness and incarceration. They work to create relationships in film, television and new media production, inviting partners in Hollywood to teach participants about networking in the industry, effective communication, leadership, accountability and the basics of production, enough to help them excel at their first job—and start preparing for their second. Art moved the crowd with his personal account of positive change in his life and career over the past 18 months, thanks to ManifestWorks. From his first gig on a Jennifer Lopez music video, to his thoughts on how the screen has been responsible for the opportunities available to himself and his fellow alumni, it was a truly unique interpretation of the theme. Art was also joined on stage by Dan Seaver, the director and one of the founders of ManifestWorks, who shared his own views on how the screen impacts Los Angeles and its integral role in the work he does. 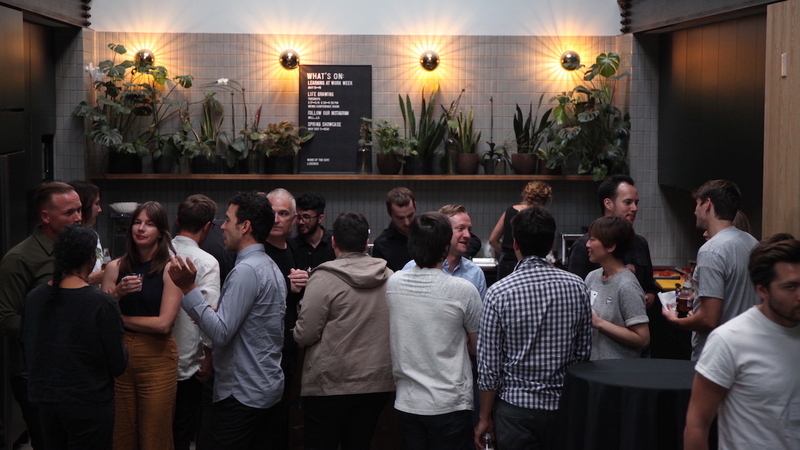 Thank you to everyone who joined us for Glug LA: Spring Edition. We look forward to seeing you at future events!